Kale. Who are you really? I've always thought kale had the worlds best PR agency working for it, as every time I tried to enjoy it, I found it tough and kinda unpleasant. I marveled at the people around me that were smashing kale on everything including their t-shirts and worshipping at its alter like a strange new cult. I'm still mildly suspicious, but I do love kale chips, and clearly, when the word chip is used after anything, it makes the world a better place. Keep an eye on the timing with these suckers, they can get away from you, and quickly become a darker (and inedible) shade of kale. I've been loving a very cool vegan bacon seasoning condiment by Deliciou that makes these next level, but you can spice them up any way you like, from simple salt and oil, to all the flavors of the subcontinent and beyond. spices (can be anything from vegan bacon seasoning, to a chili salt mix, to some vegan stock powder, cumin and coriander, whatever you want to experiment with. I like mine salty and a little spicy). 1. Set oven to 190 degrees. 2. Trim kale and remove tough stems, you want to work with the dark crinkly leaves predominantly. 3. 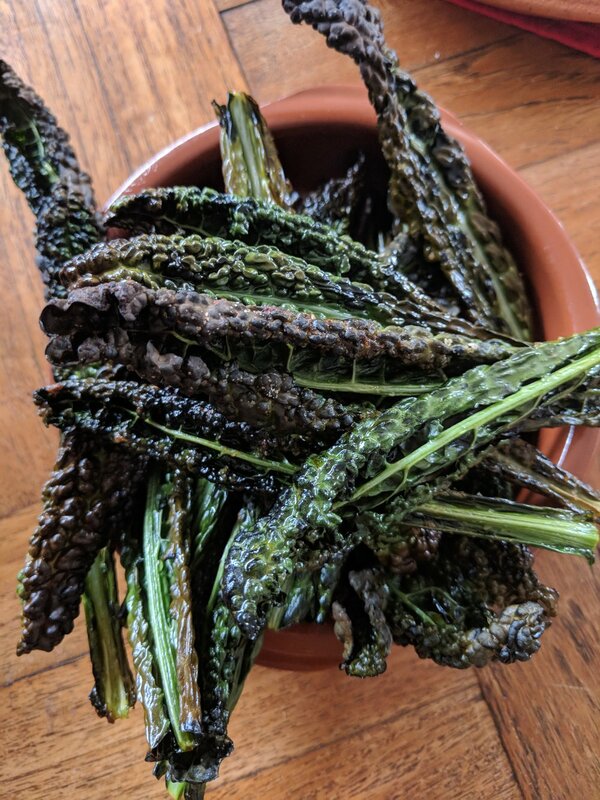 In a large bowl mix together your spice mix, oil and salt, and rub over the leaves of the kale, you can massage them as you go to get the flavor in and tenderise the leaves. Make sure all the leaves are well coated with the spice and oil mix. 4. On a baking try, lay the leaves flat, use more than one if they don't fit rather than overlapping as they won't get crispy. 5. Bake in the oven for 10 mins, check to see if they are done, and if not give another couple of minutes. The leaves will go a little brown and they should be crisp when you feel them. 6. Remove from oven and serve, or you can use as a garnish for a crunchy textural element.